HOLYOKE, Mass. – Battle-tested boxer Derrick “Double Impact” Whitley (24-25-3, 11 KOs) returns to the ring for the first time in nearly four years to headline a pro boxing show in his hometown of Holyoke, “Homecoming,” June 25 at the Boys and Girls Club of Greater Holyoke. The crafty southpaw takes on former Interim World Boxing Association (“WBA”) light heavyweight champion Richard “The Destroyer” Hall in the eight-round main event at a 190-pound catch-weight on the American Fighting Organization (“AFO”)-promoted “Homecoming” card. The Whitley-Hall match-up features a contrast in styles. Both are lefthanders but Whitley has never been floored, never mind stopped in 52 pro fights and 308 rounds, while Hall has knocked out 27 of his 29 victims. 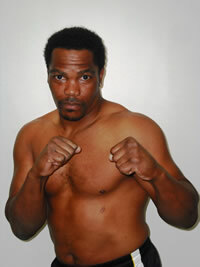 In only his 10th pro fight, Whitley fought future world champion Manny Siaca, and then Derrick moved on to eventually tangle with world title challengers Kabary Salem (twice), Randy Griffin and Rico Hoye. Hall, who defeated Anthony Bigeni by second-round knockout in their 1999 Interim WBA light heavyweight world title fight, defeated former world champion Byron Mitchell 3 ½ years ago, in addition to testing world champions Jones, Dariusz Michalczewski (twice) and Glen Johnson. Super featherweight and fan favorite Joseph “Chip” Perez (5-1, 2 KOs) returns home to fight in the six-round, co-feature against an opponent to be determined. Pro debuting junior welterweight Jair “Da-Bully” Ramos, of Waterbury (CT), and Joel Alarcon (0-2), of New Bedford (MA), meet in a four-round bout. Also fighting on the undercard in four-round bouts is Holyoke light heavyweight Pedro “Tyson” Gonzales in his pro debut vs. George Perez (0-1-1), Springfield light heavyweight Reinaldo Graceski (1-0) vs. TBA, Springfield welterweights Jose Angel “KO” Ortiz (4-6-1, 1 KO) and Noel Garcia (2-9-1, 1 KO) throw-down, and Springfield cruiserweight Jose Torres and Kovon Graham will also be making their pro debuts. All bouts and fighters are subject to change. Tickets are priced at $40.00, $50.00 and $100.00 and are available at or by calling (413.534.7366) the Boys and Girls Club of Greater Holyoke (70 Nick Cosmos Way), as well as going on line at www.afomma.com. Doors open at 6 PM/ET, first bout at 7 PM/ET.